A video installation for “South of Fletcher: Stories from the Bowtie”, a project of Clockwork and Fonografia Collective, exhibition presented by Oxy Arts. Created in collaboration with Bear Guerra and Ruxandra Guidi. Drone Footage courtesy of Eugene Ahn. An immersive presentation using a large-scale LED screen and dance floor to promote #MyFSN, a neighborhood campaign advocating for the preservation and future of historic First Street North in Little Tokyo for Sake Fest 2017. Created in collaboration with Francisco Garcia Nava and yaknowlike studios. Video loop edited by Francisco Garcia Nava. Photos courtesy of Little Tokyo Service Center. Using projection mapping and audio reactive technology in this historic building, “Memory Bank” was a 2-day installation and open mic that encouraged the public to share memories and reflections of Bronzeville and Little Tokyo. Stories were recorded and audiences of all ages were invited to be part of this 360 VR documentation. Created in collaboration with yaknowlike studios. A site-specific video map projection located adjacent to Historic Azusa Alley, the original site of the First African Methodist Episcopal Church (FAME) and birthplace of Pentecostalism. Audiences experienced the piece as it was projected on land originally owned by Bridget “Biddy” Mason, former slave, FAME Church Founder, and one of the first African American women to purchase land in Los Angeles. Created in collaboration with yaknowlike studios and Francisco Garcia Nava. A closet installation for Architecture and Design Museum's "Come In! S,M,L,XLa" Exhibition presenting archives, facts, and interviews about L.A.'s first unofficial 'gay district' in and around Pershing Square. 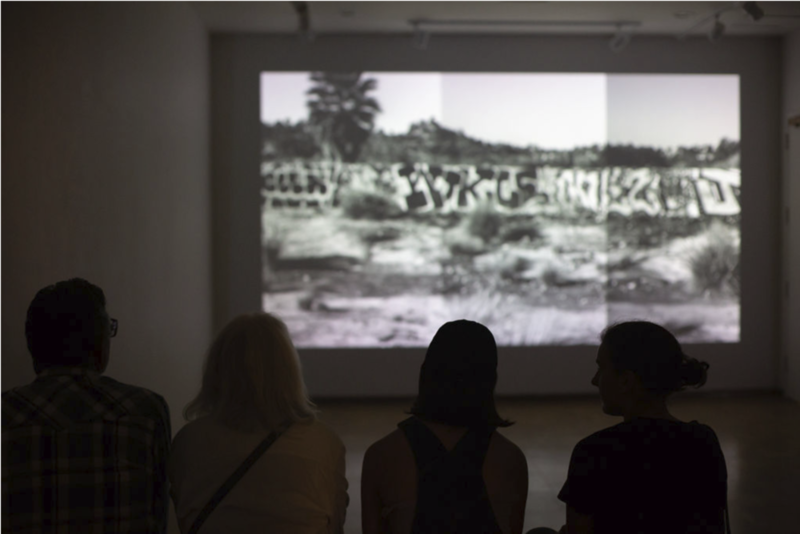 By exploring scale as it relates to perceptions of social acceptance, how boundaries are created, and how cities are shaped, OPEN DOOR presents a historic lens on place and sexuality particular to downtown Los Angeles. Created in collaboration with Rani de Leon. A video installation for Architecture and Design Museum's "SHELTER: Rethinking How We Live in Los Angeles", an exhibition featuring architecture proposals for new forms of housing along the LA River and Wilshire. Created in collaboration with Joel Quizon. How do people relate / adjust / adapt / coexist with a street and a river in flux?